Revolving handles for easy use. Baking & Preserving. Large Wooden Rolling Pin. Breakdown & Jump Leads. Curtain Wire. 45cm Large. (estimated). All orders are dispatched within 24 hours. Cupcake Cases. Air Art Cupcake Stencils. Cake Toppers. Cake Dummies. Includes removable ring guides to help to keep your paste to a consistent depth of 2mm, 3mm or 5mm. Cake Pop Stands. All of our acrylic products are designed and built exclusively by us. Easy to use on your pastry mat/cutting board or directly in the pan. 2 In 1 tool for pies, cookies and pizza dough. The small roller makes it easy to fill in dough to the edges, smooths edges and sides, and ensures uniform depth around the inner rim of the pan. Kitchen Craft Large 32cm Non Stick Icing Rolling Pin & Thickness Guide Ring Set. Vintage LARGE PLAIN WOOD WOODEN ROLLING PIN 17" X 2"
23cm Non-stick rolling pin. New in packaging. The thin blades will easily cut through thick or thin dough and the handles are double arched for comfort and elegance. The four cookie cutters nest together for neat, easy storage and are dishwasher safe. Vintage Wooden Rolling Pin X 2, Wood Handles, 10 Inch Pins! Nice! They are used, but still in very good condition. We do not use canned photos. txzj pxzj15761 txzj-11 txzj111 txzj115. Roller: Birch. Handle: Birch. Rod: Steel, Galvanized. Anthropologie HANDPAINTED LUCERNE COLLECTION. Handpainted stoneware. Rolling Pin. VTG ROLLING PIN - Wood w/ Silver Metal Handles, Baking, Collectors, MUST SEE! Pictures will show Condition, rolls good, has marks and wear. Vintage LARGE PLAIN WOOD WOODEN ROLLING PIN 19" long. Condition is Used. Shipped with USPS Priority Mail. 4" handles on each end with roller 11". Great condition. Ernesto Stainless Steel Surface Rolling Pin, Smooth, Odourless Ergonomic - New! Stable & odourless with ergonomic handles. Ernesto Rolling Pin. For rolling out evenly & effortlessly. With a smooth stainless steel surface for better non-stick. HOW DO WE DO WHAT WE DO?., so when we say it has been done by hand, it really has been personalised with a pair of human hands, and we think it looks all the better for it! Once engraved mistakes cannot be corrected. That's why Paul Hollywood has partnered with KitchenCraft to create this beechwood rolling pin. It's made of high-quality beechwood. This looks great and holds flour really effectively, so your dough won’t stick. Size: 43cm. Need Help?. Unforeseen circumstances. Model: 140018. Size: 1.75" Diam. 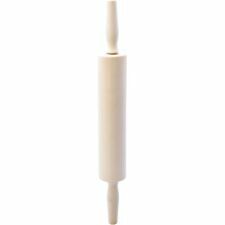 x 19.62" L. Polyethylene Rolling Pin. A rolling pin it's a necessary food preparation utensil to shape and flatten dough. The rod type of rolling pin are used by rolling the rod across the dough using one's palm. Rolling pin wooden large dough roll baking pastry roller pie pizza tool. Length 40cm Length 15.75". Another reason to start baking! Handcrafted with great care from a single piece of solid wood ERLAR is an essential baking tool. TENDERIZER: 12" LONG. ROLLING PIN: 15-1/2" LONG. HANDLES AND A MATCHING. 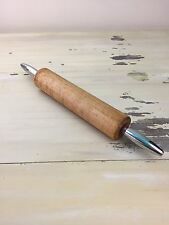 Antique wooden rolling pin with finish on the the roller that is beautiful. 1 plain rolling pin and 3 with different textures. Hours and hours of art & craft fun. We stand behind our products. We do our best to process as quickly as possible. With static handles for easy use. Bake like a pro. Part of a range of hardworking, pioneering products, tried, tested and loved by Paul Hollywood. It has an extra-long (43.5 cm / 17") design and no handles. This provides a larger surface area for easier and more efficient rolling.